As a Dachshund breeder & mentor of new Dachshund judges I would like to review how to examine and especially prioritize various aspects of this unique breed. Although in the hound group our short-legged, long-bodied tenacious dogs also have many terrier attributes. The term “form follows function” is something to keep uppermost when studying or judging Dachshunds. They have a distinct outline, multiple coat types and sizes and are described as “courageous to the point of rashness”. With the large variations in the breed how can you expect to make intelligent decisions in 2-3 minutes per dog in the ring? Where do compromises seem appropriate and when is some factor an absolute in the breed. When I judge a class I never allow the handler to “set up” their dogs to start. I want to see them moving first. Experience has taught me that a good handler can create an attractive outline stacked and a poor handler can give the impression their dog is a poor specimen. On the initial time moving, I look at proportions, head, neck, body, height, topline, tail set & carriage and ease of movement. It is a quick snapshot of balance and attitude. On the table, I firmly believe you only “examine and not judge” the dog. What does that mean? Look at parts that cannot be seen when moving or on the floor, but make no decisions on temperament or balance or movement until the dog is down and standing or moving “on its own”. Approach the dog with confidence and firmness. View the head, eye shape and color, nose and then examine the bite and teeth. These dogs “go to ground.” The teeth are the means to dig and remove roots and dirt. Then they must grab, hold and eventually kill a badger, which is a ferocious fighter. Large, strong teeth, like a terrier, in a scissor or level bite are a necessity. Teeth, bite and jaw strength is very important. Next you will examine the “hallmark of the breed”, the front. I consider the neck, shoulder and forechest in this exam. It is a “wrap-around front” with the shoulder and forelegs enclosing a pronounced sternum and oval ribcage. There must be lay back and the forearm must lay snuggly against the thorax with a protrusion of keel (prosternum) in front. Think of your hands wrapping around the chest on the sides, run your hands down the forechest and you should encounter the sternum much like a door stop that hits your hand. From the side you see the forechest both standing and moving. As in Whippet curves, if the chest disappears when they move it is incorrect. To keep the front snug around the thorax the leg bones are not straight. They curve as if molded when soft to fit the thorax. There is good substance and bone, not as much as a basset, but substantial in proportion to the size of the dog. Front feet are used to dig and need to be strong with tight arched toes, deep pads and strong nails. This dog trails and a good working hound needs good feet. The front feet are larger than the rear ones but both have well-arched toes, deep pads and strong nails. It is a disqualification for a dog to knuckle over and you may see it in the breed ring although rarely. Please look at the chest on the table from the front. It must be an oval and not round. If the wrap and prosternum are correct, you will see a lovely oval with legs hugging it like parenthesis. If the shoulder set or layback is correct the length of neck will be adequate, but not too long. Straight front or short upper arm will tend to have a shorter neck and less prosternum, like I call a “deaf shoulder” – front shoulder straight into the ear. This is a long, low, level dog. Therefore, a long, strong, well carried back rib cage with a shorter loin is essential. Many Dachshunds you examine will have more loin than rib length and the keel will stop at the front legs and that is undesirable. If they are straight but balanced front and rear you will find a “board-level” topline when they move. This is incorrect. In order to move efficiently in the field and to “go to ground” there must be the ability to collapse the legs and body into a small opening and propel themselves down a hole using teeth to dig, feet to move the dirt and prosternum to push into the hole. A good strong driving rear is needed to push into the hole and to allow them to trail in the brush and field for long periods of time. If there is no rear propulsion, the front must “pull” the dog causing fatigue and may load up the shoulders. 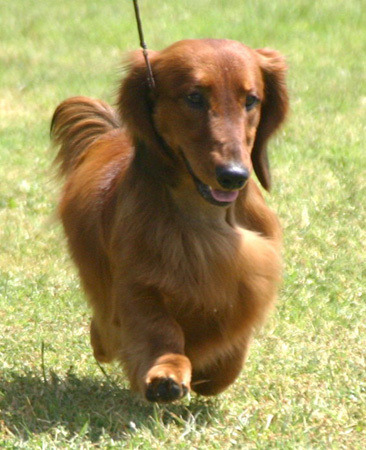 The examination of body and rear requires determining length of rib and especially carry back of keel which is lacking in many Dachshunds. The rear exam consists of checking tail set, which needs to come directly off the spine. I also examine the entire length of tail to check for any kinks. This is a recessive genetic defect that could cause problems if the dog needs to be pulled out of a hole by its tail. This is hereditary but also only a fault – check for it but never make a decision solely on the presence of a kink in the tail. I will discuss tail carriage in the area on movement and attitude. The rear legs should extend behind the dogs with short hocks perpendicular to the table and parallel to each other. A good bend of stifle is imperative. The dog should be able to hold this position without the hocks bending in and touching even when relaxed. If hocks are too long or not enough bend of stifle, the dog may be high in rear or “hocky”. From the rear I like to run my hands down the neck, shoulders and body and feel a smooth strong flexible dog. At the completion of the table exam, I immediately ask the handler to move the dog down and back. This allows me to confirm my impression of the dog’s structure and ability to move properly based on the table exam. I watch the rear and front as they go away, and don’t want to see paddling or a flipping front. A wrapped front will still show the oval chest and prosternum on the return. The front legs will not be too close together, but will move in parallel plains. As this breed has very short legs, you should not see much convergence coming or going. I also want to see a “square” driving rear and not belly-tapping or sickle hocks. Two examples of correct front and rear movement. On the return to me, I do a temperament test on all Dachshunds. I bend over slightly and hold out my hand. They need to “stand their ground”. Some will come directly to me and check for bait, while others will stop and look. They do not have to come up and love me, but rolling eyes, ears pinned back, slinking or shying are unacceptable. As the dog moves around the ring, I look at overall balance and outline and efficiency of movement. A Dachshund should hold a strong, level topline, but not one “straight as a board”. The dog moves forward with reach and drive and exhibits no bounce or roll when moving at a trot. This breed has very short legs, and the handler must not run when moving the dog. As a judge, I want to see the movement and an experienced handler knows if you run the dog and it has movement faults they are more difficult to detect. In assessing the attitude of this breed, it must be done when they are moving and standing on their own, not stacked by the handler like a statue. At times you may see their terrier type temperament in the ring, and their tails may come up, even above toplines in a curve. If the set is correct, please do not worry about this. Up is much better than hanging down with no animation. As I now am ready to make decisions about these exhibits, you may have noticed I have not mentioned either size or color. Regarding size, the miniature is only a separate class offered at a show and only dogs over 12 months of age and equal or lesser than 11 pounds may compete in that class. All other dogs are considered, by me, to be standards. I judge all Dachshunds to the same standard and do not consider size important. Proportion, balance and substance are important, but not size. We have 3 coat varieties in Dachshunds and each has its specific characteristics. (Put illustration as you see fit) All, however, cover the same Dachshund. Coat is merely the clothes they wear. All three coats must be able to function as the dog works in the field and lives on the couch. The smooth has no bald patches, or leathery ears, and the hair is smooth and shiny. The wire is double coated with hard, thick, rough, tight body hair and facial furnishings. Any lack of undercoat, or soft outer coat is a fault. The wire resembles a smooth from a distance. Grooming furnishings like a schnauzer is very objectionable to me. The long has coat more similar to a setter, not a cocker. Furnishings are found on the ears, chest, underline and tail. The quality of coat is much more important than the quantity, and the standard states “too profuse a coat which masks type” is a fault. Remember; do not make final decisions on the clothes, but on the structure and attitude of the dog. A brief note on color is needed here as well. Our breed has developed into many and varied colors and patterns in the recent past. There are purists in the breed and then others who wish to be all inclusive. The parent club membership was polled and voted to exclude the pattern double dapple (attached pic), based on potential health issues. The question of banning the pattern piebald (attached pic) however, was rejected by the membership. The board of directors of DCA issued a directive on “excessive white on dogs”. This directive indicated the piebald should not be considered for awards. The standard at no time addresses the amount of white except to say a small amount on the chest is permissible but not desirable, except on dapples where a “large area of white on the chest is permissible”. As a member of the parent club, I personally object to the board overruling the vote of the membership on this issue. There are so many very serious issues which are functional and not cosmetic in our breed currently, I would love to see color at the bottom of the list of decision making criteria. Remember a front that wraps, prominent prosternum, ribs that carry back with a long keel to support a flexible spine and a strong driving rear with an attitude like a terrier. This balanced breed works in the field, following a trail, then goes to ground against a tenacious and vicious quarry. The “clothes” make the difference in variety, and size does not really matter. Form follows the function of a hound-terrier hunting dog which also makes a loyal but stubborn companion. I hope now that you have read this entire article and the breed standard, which is one of the very longest; you can understand how I prioritize when judging. This may assist you in your future evaluation of a breed many people find difficult to understand and judge. Good luck in the ring, and enjoy our delightful but tenacious dogs.